Our Eb Bass section are Rodney Cook & Steve Hayward. Rodney started playing on the cornet aged 9, taught by his dad Graham (currently on baritone). In 1984 he married Tracy (cornet section) and they have 2 daughters, Helen (Solo Horn) and Sarah. Joining Rodney on Eb is Steve. Having played with the band in the 1970’s/80’s Steve has fitted back in as if he has never been away. At the bottom end of the band on Bb Bass we have John Grayson. John is not technically a ‘member’ of Woodhouse band as he plays for Stannington but he came to help out in the late 1970’s, met Jeannette (cornet section) and has 2 daughters, Gemma (Prinicpal cornet) and Lindsay (cornet section) and is very much a part of the Woodhouse ‘Dynasty’. As we only have a combined picture of our trombones and basses, you’ll see this picture a couple of times. 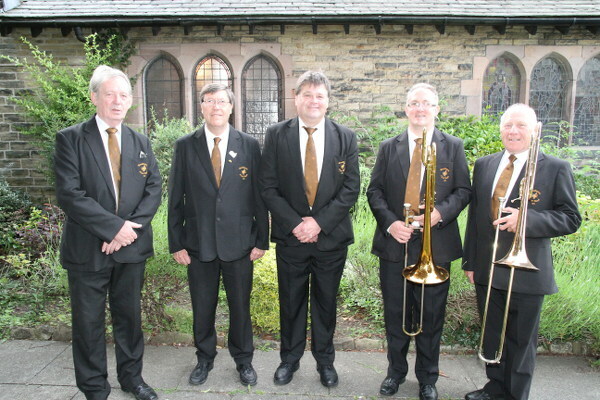 Left to right we have our bass section consisting of Arthur, John, Rodney followed by Alan on bass trombone and Bob on solo trombone.